ST. LOUIS – Adopting 10 children into a family might seem daunting, but it works for Randy and Linda Koenig who live in a St. Louis suburb. Their children, adopted between 1990 and 2002, now range in age from 16 to 23. They sing as “Twice Adopted” at the historic Owens Theatre, Branson’s first theatre, which the Koenigs manage. The name indicates inclusion in a physical family as well as a spiritual family, as all the children have surrendered their lives to Jesus. After 11 childless years of marriage, the Koenig home eventually became filled with children. “There was a person the Lord brought into our lives that told us about how they adopted from Peru,” Linda said. The Koenigs agreed to adopt. Linda spent three months in Peru working through the process, and came home with babies Callie and Katie. In 1996, the Koenigs got a call about a U.S. born baby, whose birth mother wanted to give her daughter a Christian home and Kimi joined the family. “The rest of the children came the same way. We weren’t looking to adopt more but someone came and the Lord impressed on our hearts to take more. They came mostly two by two,” Linda said. Eight-month-olds Karlie and Cassi, came in 1997 and two-year-olds Miguel and Antonio, came in 2000, In 2001 Keri joined them at age 11. In 2002 Christi and Kaylia, ages 11 and 9 respectively, became part of the family. The last seven came from Guatemala. Many of the children were used to orphanage group settings, so being in a large family is no big deal. The music shows began five years ago. They auditioned during a Branson vacation and were given a time slot. For the last three years, they have performed at the Owens Theatre. The group has three CDs. 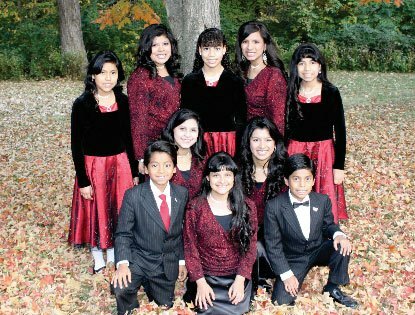 They have sung at their home church, Amazing Grace Baptist Church, O’Fallon, as well as other churches and public venues. At Branson, they do a morning show, but will accommodate larger church groups with other concert times. On Branson’s off-season, they tour, which in January includes Florida. “I love being a mother of ten children. There is never a dull moment nor a spare one,” Linda said. She left teaching college students to homeschool. Some members of Twice Adopted are taking on-line college classes. “Teaching is my passion,” she said. “There was a period of time we had 10 teenagers in the house,” Randy said. After all, there was a time five of the children were toddlers. “Each story (of how the children joined the family) is extraordinary. I had such a great time when they were toddlers. They were so teachable. Some of the children didn’t speak English when we adopted them,” Linda said. Friday nights are family night. A schedule, contact information and more are at twiceadopted.org.